Cinnamon Chasers is the electro/nu-disco moniker of producer Russ Davies (son of Dave Davies from legendary 70’s Rock band The Kinks), described by one of the biggest dance music stores - Juno as "a fusion of Aeroplane, Friendly Fires, Kris Menace and Alan Braxe, with a dash of Vangelis and Jean Michel Jarre thrown in." Cinnamon Chasers gained major notoriety with the track and music video for Luv Deluxe which won the SXSW Award for Best Music Video. The video has been a major viral hit on the internet with over 10 million views on the web and screened on over 30 film festivals worldwide, including nomination for best Dance Video at the UKMVAs. Cinnamon Chasers has performed globally for the last 2 years throughout Europe, Australia and South America, and has been recently touring USA playing at major EDM events Camp Bisco, Counterpoint Festival, City Bisco, Lights All Nights, and club shows at over 20 cities across North East USA. While not touring or working on a new album, CC is busy in the studio producing pop acts and song writers, remixing bands like Roxy Music, The Orb, The Perishers, and composing for TV and adverts for companies such as BBC, Sony, Cadbury, Castrol, Calvin Klein. 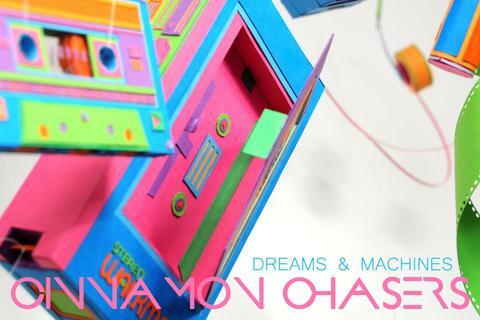 Cinnamon Chasers’ new album “Dreams & Machines” was released this Autumn 2012 and got support from many key music blogs that tip the album as the “most impressive of all”. “Dreams & Machines” is as diverse and varied as you would expect from such a prolific producer, featuring a myriad of dreamwave soundscapes, hyperspaced beats, funky analogue basslines, cut-up vocodas and energized melodies.